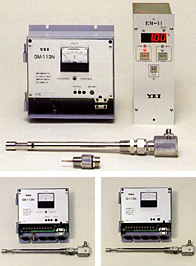 Measures the water content in detergent using the differences between the dielectric constants of detergent and water. This series copes with the conventional problems (contamination of flux and influence by change of temperature) by correction calculation of conductivity and temperature, so it can measure water content more precisely. In addition, this series can be used easily in plant fields as it has a guard shield to eliminate cable capacitance and stray capacitance though it is for one end installation type different from other impedance measuring devices. It is designed to have strong durability on harsh environment. Install the meter in a position where its measurement will not be affected by washed out dirt (such as next to a washing device, or on top of a washing tank, as shown in the figure above). Bubbles in liquid of the sensor may badly affect the measurement. Install the meter where there are few bubbles. If a moisture meter is installed in a location where the temperature changes rapidly, we recommend using a temperature correction. Add water to adjust the moisture at a point before the pump, in order to mix the fresh water with the cleaning solution effectively (see the figure above). If you add water too quickly, it may cause you to add too much water. We recommend gradually adjusting the water content at as low a flow rate as possible. The meter cannot measure dirt if the liquid temperature is not constant. Note 1: The dirt level cannot be measured if the dirt itself does not cause a change in conductivity. Note 2: The GM-113N, M-113N can measure only one sample. But the GM-113N-EM can measure the moisture levels of multiple samples by altering the register scan lines.